my Mom and family resided at the US displaced persons camp post World War II. Does anyone know if the camp still exists. We'll be visiting this spring with my Mom and my kids. 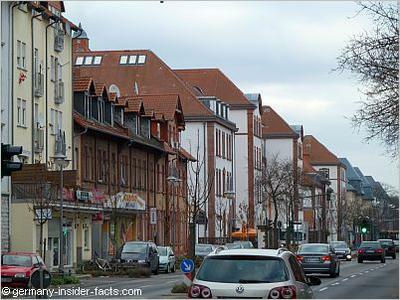 I did some research about the displaced persons (DP) camp in Hanau and came up with this info. Actually, it is hard to find mentions of displaced people camps at all. 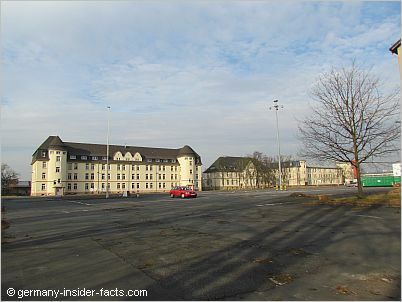 Obviously even US soldiers who were based at the barracks after the camp was closed, hardly knew that it had existed. There was a camp at Francois Kaserne installed immediately after the end of WW II. It was closed when the US army took over the barracks. There was another camp at Hutier Kaserne. I don't know how long at all this camp existed. There used to be a cairn at the ground of Hutier that mentioned the DP camp. The camps in Hanau don't exist anymore. All but two DP camps in Germany were closed by 1952. The last one was closed by the end of the 1950s. 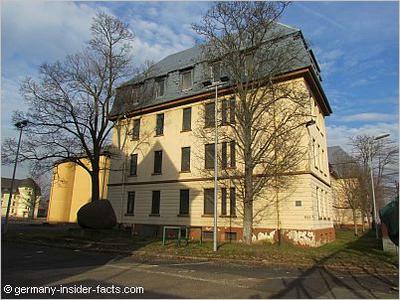 So for your upcoming visit, you can still see the buildings of the former barracks at Lamboystrasse in Hanau. Since the US army left Hanau, they have all turned to civil use. The historic buildings of Hutier Kaserne have been sold to an investor just recently. The buildings will be renovated and provided for commercial and industrial use. The buildings of Francois Kaserne house offices and a school for adult education, amongst user uses. Hanau has changed a lot since those years after WW II. I wish you and your family a pleasant stay. Stationed in Hanau 1958-60. Traveling from city on Lamboy Strs. past Hess-homburg Kersene there was a dirt road to the left that led to where some of the DP Personnel still lived. I dated a girl from there. My mom was born sept 9 1946 in Hanau to a 15 yr old polish girl who had a relationship with an american soldier. She had lost her mother to Typhus . so it was her and her father and younder sister. She gave my mom up to a Latvian couple who came to canada. My mother at 73 still yearns to know her mother. There are probably hundreds of stories just like this one. the direction of the city itself. Now they generally look like regular apartment buildings. My Latvian born father, Aleksandrs Zagorskis, his cousin Jevgenija Lielkajis, and my fathers army buddy, Arvids Lielkajs, all lived here for a time after 1945. They attended Latvian school and lived in the old police/court house building in a basement room. I was fortunate to have a personally guided tour of the site in 2016 by Arvids (who has just turned 90 but has an excellent memory). As mentioned in other posts, the site is now under renovation but the externals look like they will be kept so those with memories of those times will hopefully have something to cherish. Our family lived in one room in the building with the SKOLA sign. The common bathroom was down the hall at one end and the common kitchen was at the opposite end. In between other rooms housed additional families. I attended a Latvian first grade in the same building. We emigrated in 1949 from Bremerhaven on the ship General R L Howze bound for New York. I remember the camp being in a U shape. Lots of land at the top of the U. Many families raised pigs to supplement scarce food. Our pig got stolen the night before it was to be slaughtered. I went to school there (Latvian), became a girl scout, took piano lessons. Our family of four lived in one small room. I bless my parents for bringing me and my brother to America. Eight year old at camp. Dec., 1945. 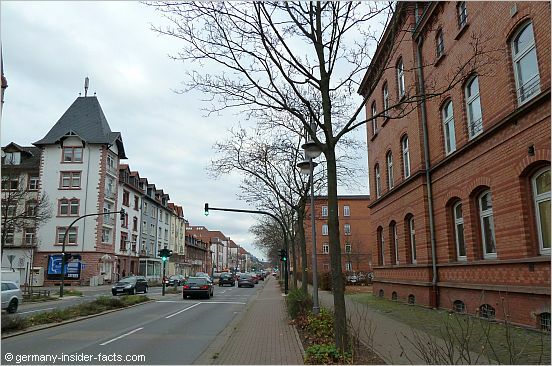 My family lived in two places in the Kaserne and I started school there. I was a MP and lived on Hutier from 1992-1996. I have great memories of my time there. I had no ideal it had been a DP camp. Thank you for posting these pictures. I fear this is too late for your trip. When you enter Hutier, turn right and go to the last barracks on the right (it's a 3 to 4 story building). You will see a stone about 3 feet tall commemorating the Displaced Persons Camp. Hope this helps. of $6000 was miserly, but I suppose it was the thought that counted! Amazing that the Germans had all the info on her, how she was brought to Hnau against her will from Russia!! My family and I left Gotha in 1945 when east Germany was turned over the Russians. Ended up in the DP camp in Hanau. Lived there until 1948 than we got passage on the first UNRRA sponsored ship to the US. Thanks so much for the photos and the information--very helpful! 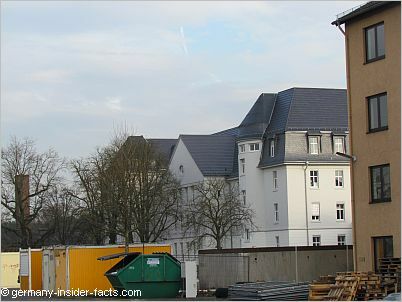 There is a lot of building activity at the Kaserne right now. The building in the background has been renovated, others will follow.